Hydrocephalus (pronounced /ˌhaɪdrɵˈsɛfələs/) is a term derived from the Greek words "hydro" meaning water, and "cephalus" meaning head, and this condition is sometimes known as "water on the brain". 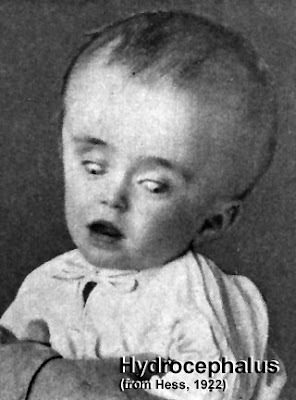 People with hydrocephalus have abnormal accumulation of cerebrospinal fluid (CSF) in the ventricles, or cavities, of the brain. This may cause increased intracranial pressure inside the skull and progressive enlargement of the head, convulsion, and mental disability. Hydrocephalus can also cause death. Hydrocephalus treatment is surgical. It involves the placement of a ventricular catheter (a tube made of silastic), into the cerebral ventricles to bypass the flow obstruction/malfunctioning arachnoidal granulations and drain the excess fluid into other body cavities, from where it can be resorbed. Most shunts drain the fluid into the peritoneal cavity (ventriculo-peritoneal shunt), but alternative sites include the right atrium (ventriculo-atrial shunt), pleural cavity (ventriculo-pleural shunt), and gallbladder. A shunt system can also be placed in the lumbar space of the spine and have the CSF redirected to the peritoneal cavity (Lumbar-peritoneal shunt). An alternative treatment for obstructive hydrocephalus in selected patients is the endoscopic third ventriculostomy (ETV), whereby a surgically created opening in the floor of the third ventricle allows the CSF to flow directly to the basal cisterns, thereby shortcutting any obstruction, as in aqueductal stenosis. This may or may not be appropriate based on individual anatomy. Because hydrocephalus can injure the brain, thought and behavior may be adversely affected. Learning disabilities including short-term memory loss are common among those with hydrocephalus, who tend to score better on verbal IQ than on performance IQ, which is thought to reflect the distribution of nerve damage to the brain. However the severity of hydrocephalus can differ considerably between individuals and some are of average or above-average intelligence. Someone with hydrocephalus may have motion and visual problems, problems with coordination, or may be clumsy. They may reach puberty earlier than the average child (see precocious puberty). About one in four develops epilepsy.